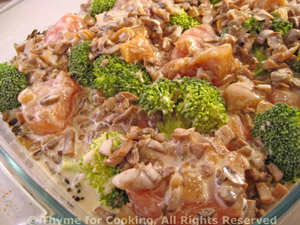 Wild Rice, Chicken and Broccoli Casserole, Thyme for Cooking comfort food. This is a classic, mid-western US, casserole or hot dish. Normally made with Cream of Mushroom Soup... I have made some slight modifications. With leftover wild rice it goes together quickly - you just have to make the sauce. Roughly chop mushrooms. Sauté in oil, in medium skillet, until tender and starting to brown. Add chicken stock, thyme and bring to a simmer. Dissolve cornstarch in water and stir into chicken stock, stirring until thickened. Cut the chicken breasts into 4 pieces. Cut the broccoli into florets with some stem. Spread the rice out in a baking dish just large enough to hold everything (I used a 9 X 11, 22cm X 27cm). Arrange the chicken and broccoli on top, pressing them into the rice. Spoon the Mushroom Sauce on top, cover with a lid or foil and bake, 400F (200C) for 40 minutes. 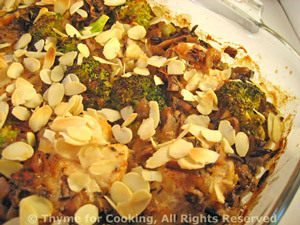 Uncover, sprinkle with almonds and bake for 10 minutes longer. Serve.